Well, Nick Charles punches Nora Charles in the face. There are a large number of jokes about dogs peeing. The police just punch a dude in the face for being lippy. Bigamy is a large part of unwinding the film’s conclusion. I’m an adult, and as an adult, I’ve found that life is rather quite boring for the most part. You get used to eating, breathing, cooking, cleaning, and walking the dogs, and much of life begins to blur together. As such, I’ve often wondered what the sophisticated couple who has wisely disavowed children are supposed to do with their long, responsibility free days. 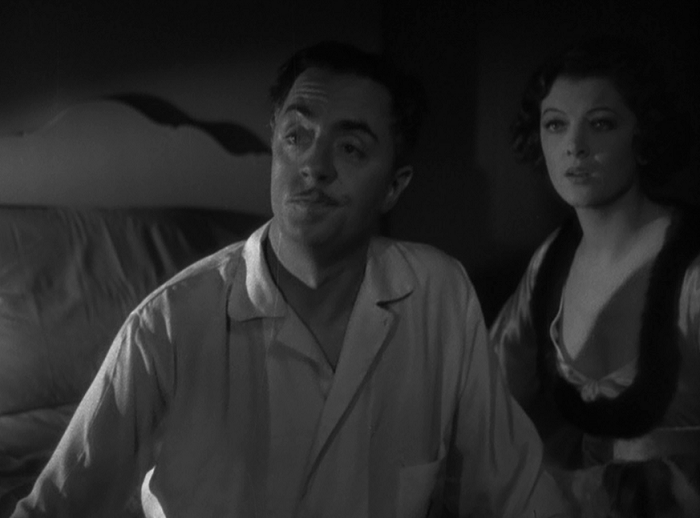 Much like Nick and Nora Charles of The Thin Man, I do believe a constant state of inebriation is a pleasing option. The two socialites for whom the film revolves around indulge in every manner of alcohol that one can imagine, and find it to be an absolutely splendid time. That there’s a murderer lurking in their midst is hardly much of concern. The concern may belong to us though, the few, the proud, the people who are here to recite plot to you in case you weren’t paying much attention. 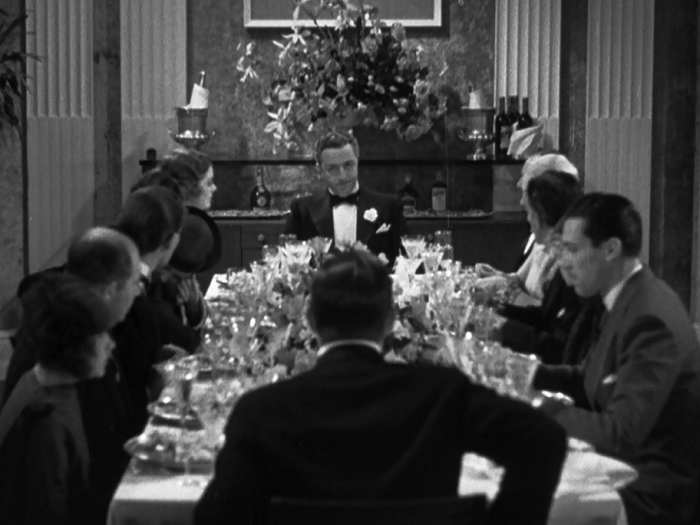 The Thin Man is about social drinkers the Charles and what happens when an old friend is accused of murder. Bodies pile up; shenanigans abound. The cast is peppered with tons of great actors like Edward Brophy, Porter Hall, Harold Huber, Cesar Romero, Natalie Moorehead, Mina Gombell, and Maureen O’Sullivan, with each getting their turn to play suspicious to just the right degree. The movie does a sublime job in pointing the audience away from the most obvious suspect, with even detective Nick Charles at the end admitting he’s just playing them off each other until the true criminal will get annoyed enough to pull out their gun. That being said, the mystery is still pretty much a drag. Considering we don’t get to the titular couple for the first ten minutes and long stretches are spent with them apart, the mystery can get kind of wearying. But that’s okay! 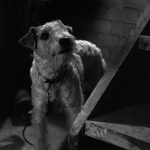 Nick isn’t much of a detective– the couple’s dog, Asta, does some of the film’s heaviest lifting. What matters is Nick’s personality, that of a gumshoe exalted to a socialite bored to the point that drinking is not only an escape but an essential lifestyle choice. One must wonder upon learning that his marriage to rich heiress Nora removed him from the position of hard working detective whether or not he drinks merely out of boredom at his upper class lifestyle or if he’d always been that way. Considering the later entries in the series, I’d assume the booze is what is keeping Nick going. So Nick’s become an alcoholic, and it appears Nora is more than happy to share in the fun. Like with Don Birnam, the main character in The Lost Weekend (1945), they’re a treat to be around when they’ve had a drink. To one up Don Birnam, they ain’t actually that bad when they’ve got a hangover either. Powell’s virtues I have extolled many times, and will continue to do so with pleasure– he’s urbane and sophisticated but also glib and playful. He was the anti-Clark Gable of his time, someone who didn’t reek of overt sexuality but rather sly innuendo. Like in the spectacular Jewel Robbery or even in middling pictures like Private Detective 62, Powell’s ability to be two steps and a wink ahead make him irresistible. His drunk acting as the disaffecting Nick Charles is also splendid, revealing a character of consummate inebriation and infinite fun. I do this all the time too! … I DON’T HAVE A PROBLEM. 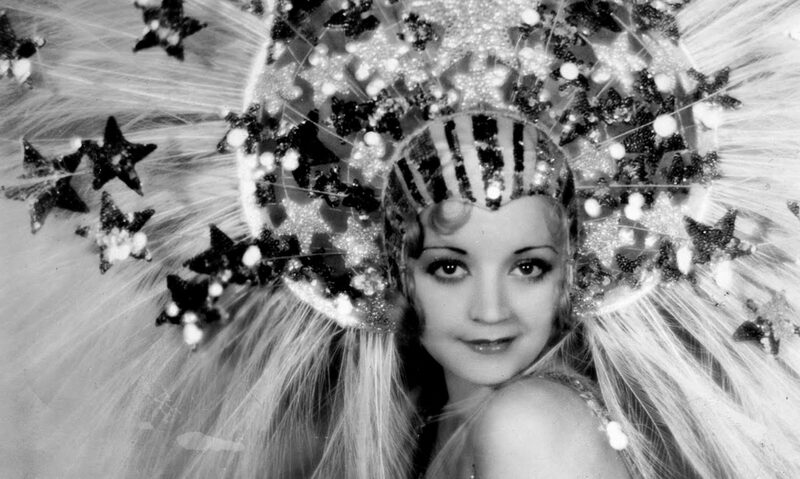 Loy spent most of the early 30s stuck as ‘The Other Woman’ as in Arrowsmith or typecast as foreigners of eastern descent in yellow face, as when she was Fu Manchu’s daughter or a psychotic Javanese killer. She did those parts dutifully, though that may be because few could play cold and cool like her. 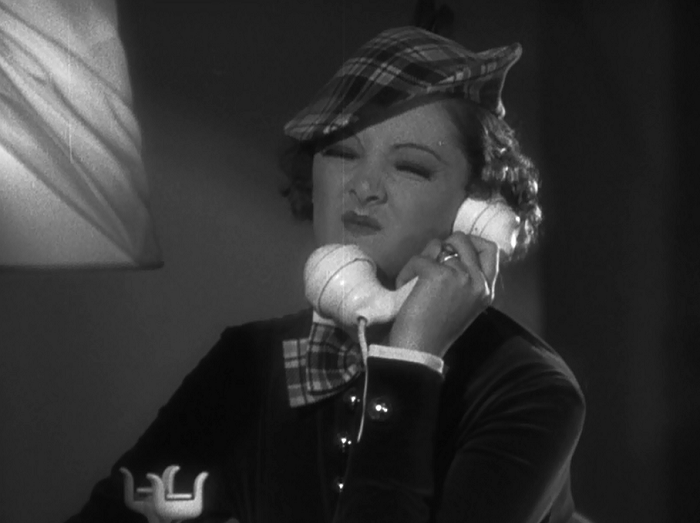 In The Thin Man, though, given the chance to show off her comedic chops is a godsend. Her scrunched up face is elastic, and her ability to inflate and deflate those around her with simple smiles and sideways glances make her the perfect match for the usually untouchable Powell. Speaking of untouchable, there is a point in the movie that can be a sore spot for some viewers. During one lengthy sequence where Nick and Nora are confronted in their bedroom by a gun wielding suspect, Nick opts to punch his wife in the face and get her out of the path of the bullet, rather than… not. While I’ve never had too much of a problem with spousal abuse (other than the fact that my wife thinks sucker punching me in the kidneys is “hilarious”), I can see why this would turn some viewers off. However, and believe me when I tell you this, women were just assumed to be more rough and ready in the 30s. Like drunk driving, punching women was considered wrong under many circumstances, and both would grow much more taboo over the ensuing decades. Nick and Nora are also much more slapsticky than many of their screen partners. One beautiful non-verbal bit, as Nora suffers from a hangover and Nick gloats while an associate is talking on the phone, is pretty much Three Stooges stuff. The duo’s famous dog, Asta, gets to partake as well, as the Wire Terrier operates with an innate knowledge of what his humans are up to and just how silly they are to boot. 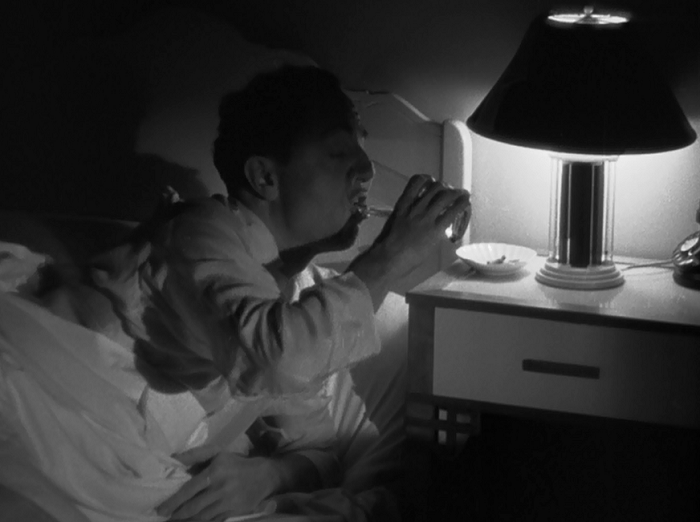 The film’s ending and fadeout is essentially a big arrow pointing to the couple– who had a pair of twin beds in their New York hotel room– celebrating the successful denouement in a shared berth, doing what people normally get to do in a shared berth. After Asta covers his tender eyes, the pullout to a locomotive chugging along at full speed is something that Hitchcock no doubt had in mind when a similar ending popped up in North by Northwest (1959). Through efforts like that, Nick and Nora did eventually procreate a successful series of follow up films as well as a prodigious offspring and a host of mysteries to solve. (That last sentence was awful. I apologize.) Like most of the great filmed detective stories of the 30s and 40s, they were about a sense of pleasure in unwinding a mystery with fun characters rather than gruesomeness or clue-filled extravaganzas. Thanks to some great writing and perfect acting, Nick and Nora remain the barb tongued ideal for couples all over the world– sober or not. 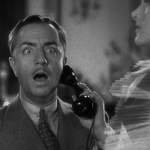 If you enjoy The Thin Man, I highly suggest you checkout Thoughts on the Thin Man, an eBook I compiled with several other bloggers which covers each movie in the series in-depth. Read more here. There are a total of six movies in the Thin Man movies series, each with Powell and Loy reprising their roles: After the Thin Man (1936), Another Thin Man (1939), Shadow of the Thin Man (1941), The Thin Man Goes Home (1945), and Song of the Thin Man (1947). I’m not much of a fan of any of the sequels– they soon transform Nora into the ‘nagging wife’ archetype that the late 30s and 40s were so fond of and much more relies on Asta’s complicated love life for humor. 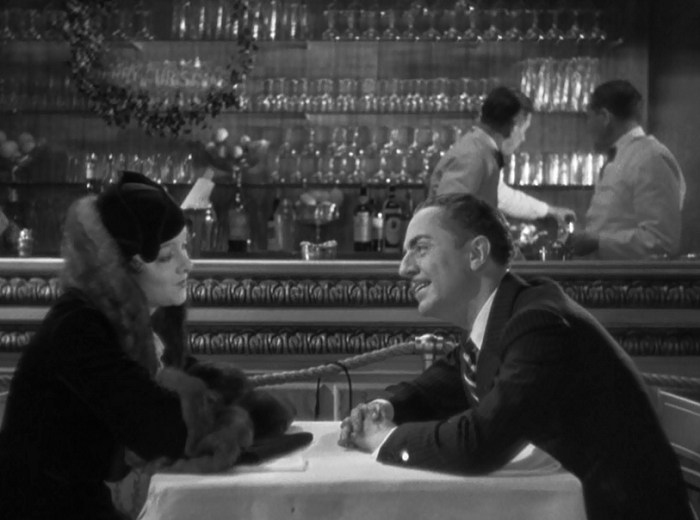 But if you like The Thin Man, you could do worse than giving them a shot. 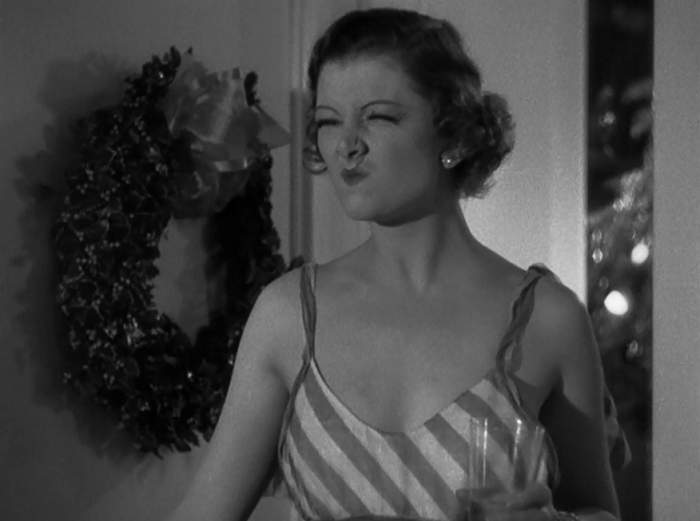 I think this is Loy’s reaction to Song of the Thin Man, for the record. 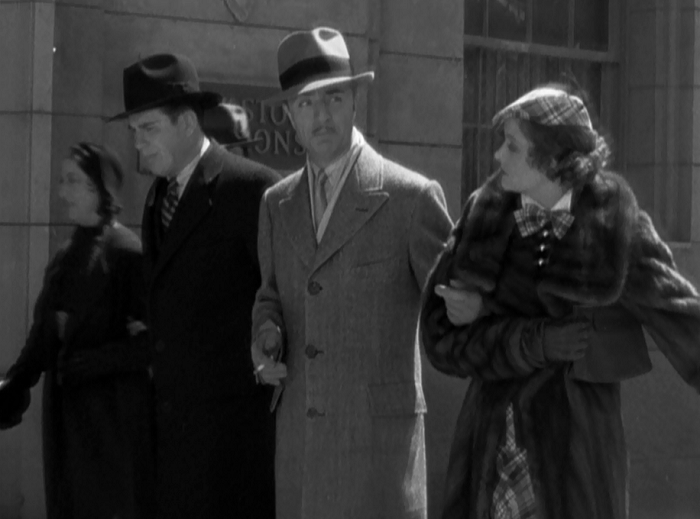 Assuming as we must that “The Thin Man” is not about a series of murders and their solution (that entire mechanism would be described by Hitchcock as the MacGuffin), what is it about? It is about personal style. About living life as a kind of artwork. Director W.S. Van Dyke does some great work with shadows in this movie, even if the film’s overall look isn’t extremely noteworthy. Cliff over at Immortal Ephemera calls this one of Nat Pendleton’s best roles, and further luxuriates over the supporting cast. Hollywood Dreamland talks about the way the film introduces us to Nick, and details where you may have heard of its many supporting players. According to the Production Code, dogs just stopped peeing altogether after July of 1934. A Shroud of Thoughts outlines the surprising similarities between the Thin Man series and It’s A Wonderful Life. Film Noir Photos has a bunch of publicity pictures from all of the entries in the series. 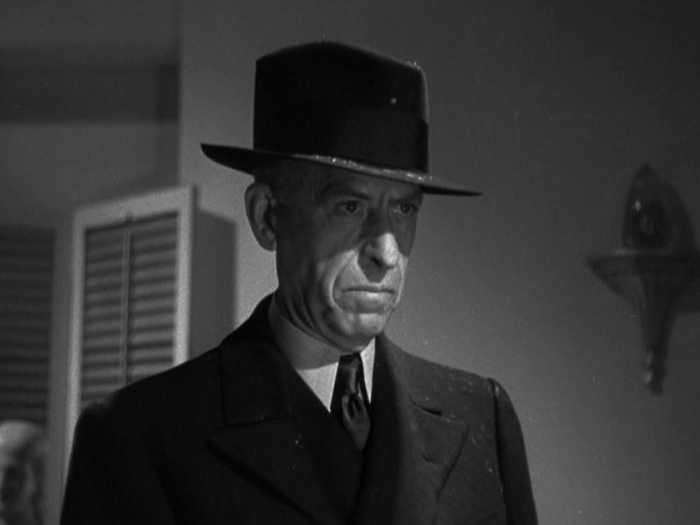 Movie Classics compares Dashiell Hammett’s novel to the film version. Oh, hey, that’s the titular thin man. That the series is named after. Who dies ten minutes into this entry. Whoops. 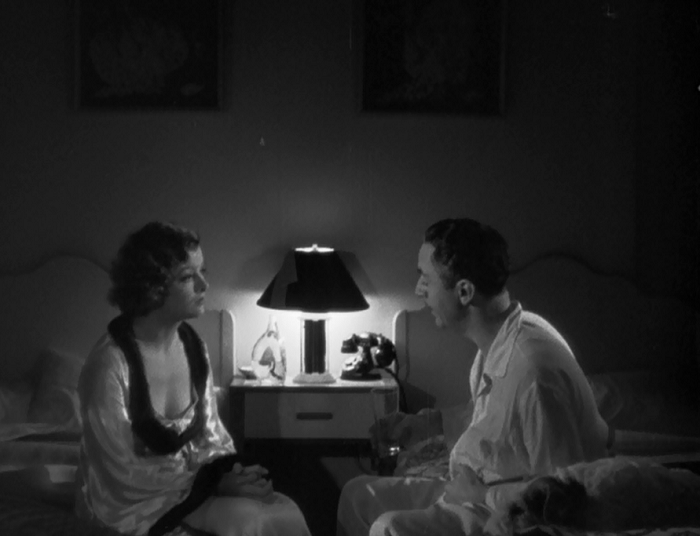 I’m not linking anything here, because I’m just that classy, but there’s a number of people who hold this in much higher regard than 1934’s Best Picture Winner It Happened One Night. To those people I say: I enjoy both movies, but, seriously, hogwash to that. I usually include more links, but this is another one of the more famous movies of the 30s. Check out some good writing on it from Collector’s Corner, Common Sense Media (with discussion questions! ), Doom Cheez Cinema, and True Classics. 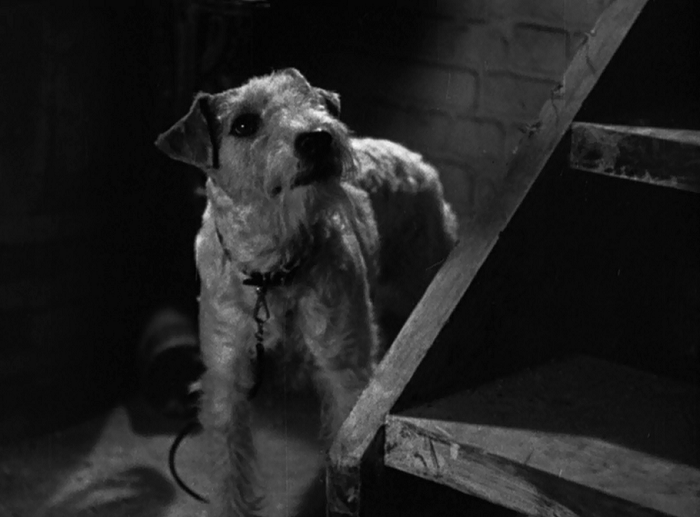 And a nice chaser– all you ever needed to know about Skippy, the dog who plays Asta in the film, from Films of the Golden Age. He would later go on to costar with Cary Grant in The Awful Truth (1936) and Bringing Up Baby (1938). Nominated for Best Picture in 1934, and Powell was nominated for Best Actor. How Loy escaped a nomination is anyone’s guess. This film is available on Amazon both streaming and on disc form, and can be rented from Classicflix. Glad to hear I’m doing something right. 🙂 Thanks! It’s funny how the Code took some of the edge off of the sequels. In the first one they spend 3/4 of this film completely trashed at all times. I think deep down this film understands that basically all mysteries plot wise are kinda…junk. I thought about it and I really don’t know of a single mystery film I enjoyed for the mystery plot itself. It’s all about the characters and the dialogue. I’m glad the Depp remake has been shelved for the time being. This is a film purely about the chemistry between the stars and honestly I can’t think of hardly any female costars Depp has had any chemistry with. However, I think a Robert Downey, Jr./ Gwenyth Paltrow remake might be interesting. Yeah, the movies sanitized and domesticated the Charles before they got a chance to really let loose. I always found having a kid really messed up the chemistry, too, but then again I haven’t even tried to watch the sequels in probably six or seven years now. I think Downey Jr. is pretty much the only Hollywood actor right now with enough debonair charm to pull off a William Powell or Cary Grant role. And I like Paltrow a lot, too, but she’s always struck me as a little self conscious. Now Charlize Theron? I could dig that. 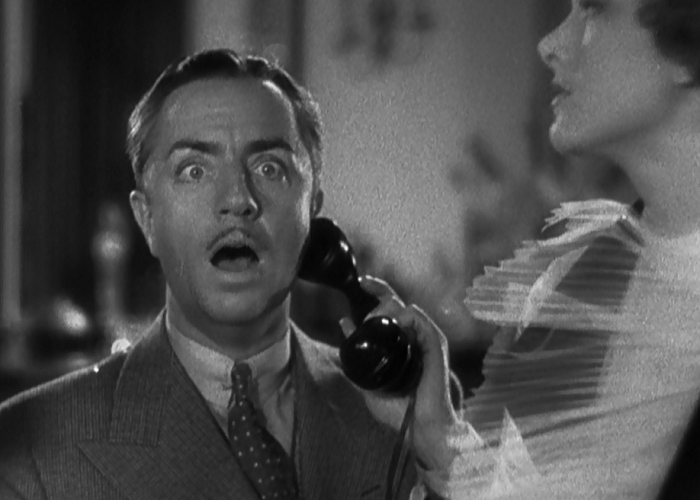 Like most folks I’ve lost track of how many times I’ve seen “The Thin Man”. Who doesn’t want to spend time with Nick and Nora? It never occurred to me to be offended when Nick socks Nora. Will I be drummed out of the sisterhood? I don’t know about being drummed out, Patricia, as it never even so much raised a blip to me until I caught a discussion on a movie forum where someone said it ruined their enjoyment of the film. I can’t even comprehend taking offense to it, but I’m worried that that maybe watching too many rough and tumble oldies may have given me a warped sense of what to expect. I will say that I think it’s the most well intentioned punch I’ve ever seen! You’re way off the mark here, Danny. How dare you infer ‘hic’ -shcuse me -that Nick Charles ishn’t a great detective, or that there’s ANY jokes about Asta peeing. You should see this a few more times before being so haughty – I didn’t like it nearly enough the first time as I do now, a hundred viewings in. The mystery is complex and needs a few viewings to suss itself out, but it’s pretty true to the Dashiell Hammett original, so impune its plot and you impune the master! Heh. I guess I could be nicer to the plot– it makes sense, even if I do think that they tip their hat on the lawyer a bit too soon. But it really does take backseat to the interplay between the couple, and I don’t think that’s a problem. As for Hammett, I mean the man no disrespect, and have bought a collection of his short stories to atone for any perceived slight! The bit with Nick on the couch playing with his new air pistol is my favorite scene. I love the deadpan way that he goes back to sleep after he breaks the glass. That part is definitely great. I meant to get some .gifs of his trick shots, but I had too many as is– the movie is just too good! Definitely agree that Nick and Nora are a lot more fun than the mystery plot. Powell and Loy make a great team – I love her entrance with Asta at the start of this. Thanks for the link, Danny. After watching this, my wife now sees Nora as a role model and this terrifies me. And, as always, thanks for the great writing, Judy! I’ve honestly never thought of Nick punching Nora as any kind of abuse or found it at all offensive. He was trying to save her from being shot and did what he had to in a split second to get her out of the way. It’s not like he makes a habit of socking her! I think they’re great together, even if I’m not always a fan of their movies. Love Crazy and Manhattan Melodrama are probably the only other two I’d recommend wholeheartedly, but I may just be weird like that. This is one of my all-time favorite movies. Yes, I like it more than It Happened One Night. 🙂 But they’re both pretty great, so I won’t begrudge it one way or the other. I think Nick and Nora are one of the best married couples in the movies – they’re great friends, great partners, totally trust each other (and are both worthy of that trust), and yeah, if my husband had the choice of punching me or letting me take a bullet, I know which I’d choose!